I find too many blogs posts hard to keep up with anyway. It's lovely to go to the blog homepage (or Facebook) and see one waiting from someone who hasn't posted for awhile. It's almost always worth the wait, including this one. I love the picture and the quote. Thank you! Always good to see you here. It's a curious thing the way the blogs start to take on a life of their own - I will slowly work through my backlog of books to post about...there are some wonderful stories I've been finding recently. Love the pic and even though I feel guilty for buying more books than I can possibly read I love to see them sitting on the shelf both the read and the unread, being in our library (glorious exaggeration for what is the room that holds the bulk of the family book accumulation), I get a sense of calm and peace, books do that for me. I know what it is like to be busy, so don't feel pressured into posting for the challenge but thank you for participating and I look forward to reading your posts as always. I try, but can't feel truly guilty about buying books, Arabella. 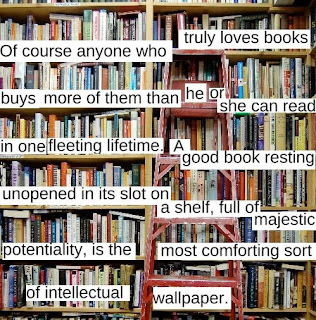 Other things, yes; books, no! I've posted for the challenge - at the eleventh hour...deadlines, as always, adding that necessary spurt of adrenaline. Hopefully, one way or another you'll have found the link. 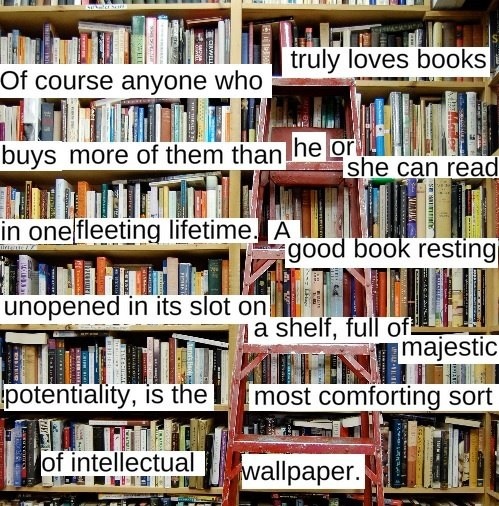 Intellectual wallpaper! I love the concept! I liked it - much more positive than the usual 'nerd' appellations!